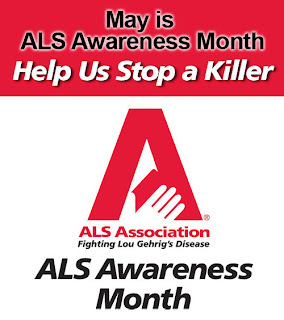 This my last "educate it forward" and ALS Awareness post for May. I'll never stop educating ALS forward until there is a cure. ALS is is only a part of my life and I will never let it define me. I have lived most of my adult years living with ALS. 19 years to be precise and with this gift of time I must be a voice for my fellow ALS warriors, keeping my own voice, mine. 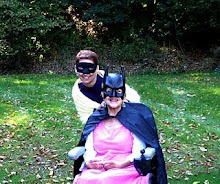 I walk with a walker due to bad balance and I have tight leg muscles (spasticity) which creates a gait. My gait, after 19yrs, has worn down knees so I use a cute scooter for stores and walks. My hands are curled like claws, leaving one finger left to type. Pincher's don't work but I still have a grip. My torso cannot help my weakened arms to lift me out of bed. Arms shake when lifted up, making it hard to get food in my mouth. I can't get too hot or too cold and my tongue muscles make it hard to speak so I sound drunk. I do not suffer at all compared to most ALS warriors. Next comes choking and aspirating on food/saliva. Then I will be sentenced to an electric wheelchair. My neck will need a brace and I will need to be bathed and wiped on the toilet. I will over salivate needing suction and must be fed through a stomach tube. Sounds easy but it can get infected or leak stomach acid burning your skin. I will gradually become paralyzed and unable to speak. I do have a computer that is banking my voice now and will speak for me using my eye's. My mind will remain sharp but 10% will get frontal lobe dementia. Lastly my diaphragm will weaken, needing a bi-bap mask to help it function. This is when I will choose to die or allow a ventilator to breath for me. I will struggle with not feeling like a woman, feeling like a burden and being abandoned. These feelings are ways ALS weakens your defenses, so I raise my shield and fight these emotions because I can. I will not give in to ALS until my last breath. Now you know what it is, how many suffer and how they suffer. Educate it forward! Thank you! strength is ours; we will live, free of dependence. we are made whole in our feast. 15 cases of ALS are diagnosed a day and most live 2-4 years. No time to fight and voices too weak to be heard. Do you know ALS? Educate it forward to be their voices. Can I pull off a Meme Including ALS? If I were a day, I'd be Monday because it's the start my week after a hectic weekend. I love beginnings. If I were a time of the day, I'd be 10am because that's when I awake and have my coffee, in the fresh mountain air. If I were a season, I'd be fall because my muscles have been worked in the summer and I'm strongest in fall. Bonus is the tree colors. If I were a planet, I'd be Saturn because it's unique and beautiful. If I were a direction, I'd be north keeping me close to God and I love Northern California where I live. If I were a drink, I'd be a glass of ice tea w/no sugar. Gives me energy when my ALS tries to steal it away. If I were a tree, I'd be a redwood living long and strong. If I were an animal, I'd be a dog. They need you and give back unconditional love. If I were a musical instrument, I'd be a guitar. It's held and strummed with passion. If I were a fruit, I'd be a passion fruit. Sweet and colorful. If I were a food, I'd be a pasta. Very versatile and energy boosting. If I were a celebrity, I'd say Hugh Lorie because he's sarcastic and his mom died of ALS. He could really impact awareness. If I were a color, I'd be red because it looks good on me, my hair and ALS color. If I were a book, I'd be a romance novel because I'm a true romantic. If I were a song, I'd be Stairway to Heaven, a high school fav sung by a crush. If I were a movie, I'd be Pretty Woman or Dirty Dancing. If I were a flower, I'd be Jasmine for the sweet smell and climbing vines. If I were a facial expression, I'd be wonder. I'm in awe of nature and love. Sara felt the sadness in the room like a heavy blanket, holding her down and unable to move. They all knew Sara had battled so very hard to beat ALS/MND and yet she had lost. The tears that trickled down the side of her face were not of sadness but they were tears of doubt. Had she done enough in her life to make a difference? Did she use her time for a greater good? How will she be remembered? Sara thought she knew the answers and yet no cure had come in time. Then there was John who's love motivated her fight. No computer could touch the grateful love she held in her eye's. Sara knew her love had been equaled in his heart by his patience and loving sacrifices. They were given to each other for a short time but a life changing time, gifts from God to each other. He was proud and thankful for the gift of Sara but he knew this was her call, her time, on her terms. He would be okay and continue their fight to educate ALS/MND to the unknowing. Sara drifted, remembering her living funeral, surrounded by her friend's and family. Their words and memories were still clear despite the haze of her morphine drip. As she took her last breath in this life, her eye's fixed on John's, she was slowly lifted into the next. Someone had said she was gone but Sara felt she was finally free! His name was Manny and he was my angel dog. Manny was boxy like a black lab, had the soft face of a boarder collie and the curly ears of a cocker spaniel. He was five and had been neglected by a neighbor's son. The neighbor was a retired cop and brought the dog to his house. He offered the dog to me and my girls because he felt we needed Manny. I had been told I had ALS five years before we were offered Manny. I was a single mom of two young girls, living in a rented house. The doctors gave me no hope or much time. I could not imagine taking on a dog. But Manny stole our hearts and even the landlord gave his approval. Manny was a good dog and he immediately knew there was something wrong with me. He was always at my side from day one, as I fought to survive ALS/MND. An example of his wings are many but it was the first time he helped me that started our journey. One day I went to get off the couch and Manny jumped up from his nap to follow. As he sat on his hind legs waiting I had just made my fourth attempt to rise. Manny began nudging me with his nose but in my frustration I ignored his concern. I tried it again and failed when Manny barked at me, while still nudging. I asked him in a pissy voice "WHAT boy?" I saw concern and scratched his neck. He kept raising his head as I scratched and then I got it. I held the arm of the couch with my left hand and I put my right hand behind Manny's head. He was still sitting but he stiffened his neck and legs while I pulled. He held firm as I stood up and in that moment we were a team. It's with a heavy heart that I must say Manny is no longer with me. He lived for seventeen beautiful years. He watched my girl's marry and even six years ago he gave up his side of our bed to my new husband. I am a very rare case of ALS because most die in 2-4yrs and I am nearing 2oyrs. Through all of my long day's, hormonal teens and falls. Manny's unconditional love remained strong. His ashes will be spread with mine as a tribute to our love and friendship. 15 cases a day are diagnosed with ALS in the US. 2-4 year mortality rate and there is no cure. Brain stops messages to muscles, leaving you trapped in your body and mind is fully aware. A cinquain has five lines. Line 2 is two words that describe the title. I've been trying to raise awareness for ALS in May by turning prompts into education. This one was a tad hard but I never back down from a challenge.